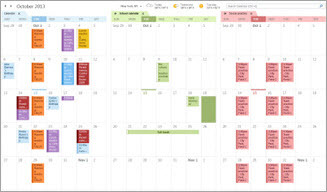 You can see multiple calendars at the same time side-by-side or combined into a stacked overlay view to help you see availability across calendars. In Calendar, in the Navigation Pane, right-click the name of the calendar that you want to view. Click Open in New Window. In Calendar, in the Navigation Pane, select the check box of another calendar that you want to view. The calendar that you selected opens next to the calendar that already appears. 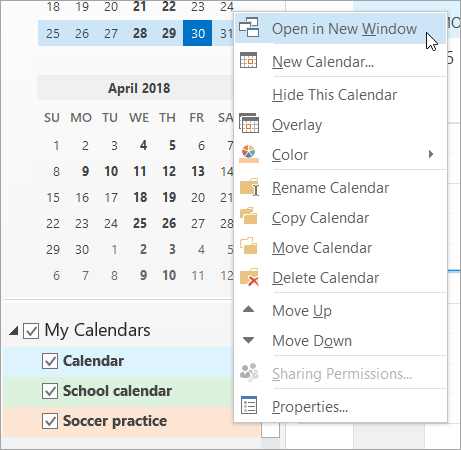 The calendar that you selected opens next to calendar that is already displayed. Each successive calendar opens next to the one most recently opened. On the calendar tab, click View in Overlay Mode. That calendar is now in overlay mode with the one you opened first — usually your default calendar. To add another calendar to the overlay, repeat step 2. In Calendar, on the tab of the calendar that you want to remove from the overlay stack, click View in Side-by-Side Mode. The tab moves back to the right. The calendar that you selected no longer appears in overlay mode. To remove a calendar from view, clear its check box in the Navigation Pane or click Close on the calendar tab.